Yippee! It's National Library Week! Every day, I’m highlighting a library thing, baking something and giving something away. It has been so inspiring to read your comments about your local library and your sweet memories of librarians. I hope you take some time to recognize the awesome information professionals in your life! Yesterday, I was the Food Librarian Fairy and delivered assorted baked goods to friends at two different special libraries. What's a special library? Special Libraries include, but are not limited to, corporate, museum, law, newspaper, medical, and private company libraries. These librarians can get data out of Lexis Nexis faster than anyone, and help you find a treasure in a museum's special collection. When you think of librarians...don't just think storytime. Think way beyond that...to someone with a law degree, PhD or a medical background in addition to a Master's degree in library science or information studies. In short, special librarians are special! What else?! Scones!! I think scones are the best! They quickly come together and you can make them in one big bowl and your little fingers. You can even make them the night before, pop in the freezer and bake off in the morning. I really like the square scone because it is really easy to form and you can just go at it with a knife or bench scraper. Cream is brushed on top and sanding sugar or raw sugar is sprinkled on top. I used mini chocolate chips because you get a bit of chocolate in every bite! Note: The cookbook's instruction include using a KitchenAid with paddle attachment. I made my scones by hand. Please get this lovely cookbook The Craft of Baking and see page 24 for the chef's instructions. 1. In a large bowl, mix together the flour, baking powder, sugar and salt. Add the butter pieces to the bowl. Place the bowl in the freezer for 5 minutes. 2. In a measuring cup, mix espresso powder with 1 teaspoon hot water. Mix to dissolve. Add 1 cup cold cream and combine together. 3. Remove bowl from freezer. Using your hands or a pastry cutter, cut in butter until it is pea size. 4. Toss in chocolate chips. 5. Pour the espresso-cream mixture over the flour mixture and blend with your hands or a spatula until dough just comes together. 6. Remove dough onto floured surface. Gently knead a couple times, but don't overmix. Form into a circle for wedges or a square, about 3/4 to 1 inch thick. 7. Place the pieces on a baking sheet. Cover with plastic wrap. Freeze for 15 minutes, or chill for 1 hour in the refrigerator. 8. Preheat oven to 375 degrees. 9. Brush scones with cream and sprinkle with course sugar. 10. Bake scones until edges and bottom are golden and they are firm to the touch, about 20 minutes. Cool on a wire rack. Day #4: I'm giving away a Silpat. You know, the wonder baking sheet liner. It's great for making most everything...everything just peels off. And if you aren't a big baker, this is great when making savory things like roasted sweet potato fries. Oh yes Silpat, you are kitchen treasure. The Silpat is "half-sheet" size. To enter, just leave a comment on this post. If your email isn’t associated with your Blogger account, please be sure to leave your email in the message. Note: This giveaway is limited to United States mailing addresses. Disclosure: This giveaway and shipping is paid for by me. Don't forget to enter the Day #1 (Sarabeth Bakery Cookbook) and Day #2 (Crate & Barrel Ramekins) and Day #3 (Everyday Food magazine) giveaways! And, if you are currently working in a library or in library school...come back tomorrow for a special giveaway just for you. :) Happy National Library Week! Ooo - that has been on my Amazon wish list for ages! These look delicious... and I love Silpats! Those scones look delicious. I never made scones before. Looking forward to trying to make this after the espresso bundt bread. Thanks for another amazing giveway! Not only do the scones look fan-freakin-tastic, I love the action figure. AND, I was just thinking 'I might need to buy a new silpat soon.' The current one is wearing out and I just can't go without one now that I have had one! You can never have too many scones or silpats! I've heard great things about Silpats but I've never had the chance to try one. Chocolate and coffee together--what could be better? Thanks for the delicious recipes and library lore! Scones are quite possibly my favorite food ever. These particular scones sound fabulous. I've been a Special Librarian for most of my library career, putting my science degree to good use. Those are my most favorite libraries. perfect for these scones! thanks for another great recipe! Those scones look so delicious. I was raised on heavy, dry, stone-like scones made by my sister. Great idea to add a little topping. I think it make these extra special scones! I'd love to win this to make these scones. Mmm! Ok, confession time. I have never loved scones. I have wanted to love scones, but I always found them too dry. I want to give them another chance and I love chocolate chips and espresso, and icing!! Thanks for the recipe and great photos! This has got to be the best giveaway idea ever! I have been coveting a Silpat for years now but can never justify the purchase. It would be great to win and no longer ruin my nice cookie sheets! There used to be a deli here that made the most wonderful lemon poppyseed scones. I miss them! i love the scones and i want a silpat so bad! mamma mia deve essere buonissimo! complimenti !!!! We need a Silpat, I have not gone out to buy one yet but I hear they work great. There is no comparison to the magic that is Silpat! These scones would be perfect...with coffee! Must make soon. So cute...I love Library Week. I just made Scones for the 1st time last week...I didn't realize they would come together so easily. I'll for sure be trying this recipe soon. Oooooo! I've never actually had a scone I liked.... I should try this recipe. I also do not have a slip mat! Yum! Those look so good! The scones look great. I finally made my first batch of scones last month and loved 'em, so now I'm looking out for different recipes. What was the texture like inside? i can't wait to try these scones! i tried the chocolate chip cream scones...so good. so good my mom made them again a few days after the first time she tried the recipe. You're so nice to have all these giveaways to celebrate National Library Week--and to educate us on libraries and librarians. I have to admit I've thought in recent years that both may become obsolete in our digital age, but reading your posts has given me confidence that we'll always need them! These scones look great and I have never thought of making the dough the night before and baking in the morning. Great shot with the librarian action figure. Love scones! "a ch a vez 2007 AT gmail DOT com"
Scones are one of my favourite sweet treats to eat for breakfast! These sound delish! Thanks for the great recipes! Whny have I not thought about making scones. These look like big yummy cookies, and I love cookies, but I hate making them. These scones would be so much easier. Thanks! ooh I'd love to try out the silpat!! bet its wonderful for making things like meringues! I have totally come around to scones (after finally have GOOD ones). And if I had a Silpat, it would be even easier to make them...along with cookies, and any kind of pastry goodies! PS. I'm a librarian! That gets me double points, right? Right? I've never made homemade scones, but I sure do get them at Starbucks a lot! This would be so helpful! Love silpat, have needed another...my favorite line about them is David Lebovitz once said on his blog something to the effect of "don't go telling me they're hard to clean, just put them in the top rack of your dishwasher!" it really hit my funny bone at the time, as I'd just decided that I could do the same thing. I love scones, but I've never actually made them myself. i could definitely use a new silpat! Your action figure cracks me up!! LOVE IT!! Happy Day National Library Day #2!!! Gadzooks, I want me some of these SCONES. The square scones are adorable...but any shape of scone with espresso in it is fine by me! Have always wanted one of these. Your food inspires me! 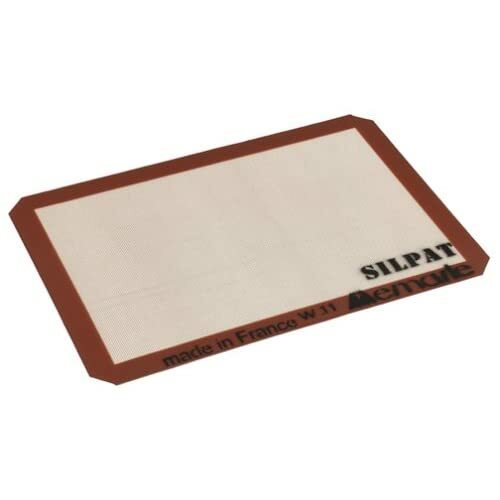 My silpat mats are one of my favorite baking accessories. At first glance, these totally look like cookies! Awesome. Scone cookies would be cool but confusing. Seriously?? Espresso AND chocolate chips AND a cookie all rolled into one?? I'm SO making this!!!! Thank you for the opportunity for this drawing. Oooo! I need a new Silpat! The edges of the one I have now are just fraying away :(. Your scones look so good. I'm bookmarking this recipe. Thanks for the giveaway! I love library week! As a graduate student, I depend on libraries. Thanks for all you do! I've been wanting a Silpat for years! Thanks for the giveaway! At first, I thought I was looking at big, beautiful chocolate chip cookies! These look wonderful and I'm thinking of making a batch today! I've put The Craft of Baking on my library list. Wow, do I need a Silpat! I have a generic one and it's just not as good as the real thing. Love the National Library Week posts! I've been needing a Silpat for a while now! "OMG" moment! The librarian action figure beside those cookies looks so cute. Scones were on a TV segment last Sunday and now I read this today. I might just need to make some! I'd love a Silpat and as always love when the Librarian makes her appearance. thank you for being a librarian!! I have wanted a silpat for years!!! Beautiful scones! Happy library week! Lovely scones ... wonderful flavors too! Looking forward to making them, thanks for the recipe! Sounds like a great recipe, I can't wait to try them! Thanks! i love the flavors here. :) fabulous! I never thought to put espresso flavor in a scone. Will have to try this one! Okay, I tried to make these, but failed miserably after leaving out the sugar--they seemed way too "wet" however, as batter...is this generally the case? National Library Week 2011 Winners!